Our unique conditions of converging biomes and our latitudinal position at the northern end of the tropics combine to create a diverse, yet delicately balanced, landscape of plants and animals dependent on each other for survival. We are the fortunate recipients of the sights and scents of their beauty. Naples is located in Zone 10a on the USDA plant hardiness zone map. But each biome, whether coastal, pinelands, wetlands, or hardwood hammocks, has its own distinct requirements that support its natural plant life. And then there is the manicured loveliness we enjoy in our human constructed spaces. This is usually a combination of native plants along with tropical imports. This, too, defines our tropical feel. The coastal area is obviously sandy and salty, so plants will reflect that reality. Plants that have adapted to grow in these conditions are crucial to the health of the shoreline, helping to keep the sand in place and providing cover for ground-nesting birds and other creatures. You should NEVER pick the grasses or flowers that grow along the shore. On a stroll down the beach you will likely see tall Coconut palms swaying with the Gulf breeze. Though coconuts are an important commercial product in many tropical regions, in Florida they are mostly grown for ambiance. However, you’ll surely want to find an opportunity to drink fresh coconut water directly from the source. Sea grapes are a common sight along the coast. They have large, flat saucer shaped leaves and clusters of edible grapes during the season. Sea grape jelly is a Florida delicacy. Among the sand dunes you’ll find sea oats, salt grass, beach sunflower, beach morning glory, sea purslane, sea lavender and buttonwood. You’ll also find railroad vine with its trumpet shaped flowers and baybean with its delicate pea-like flower. Along the shorelines of bays are the mangroves that grow in the salt or brackish waters (where salt and sweet water meet). Florida has three species of mangroves: red, black and white. The red mangrove (Rhizophora mangles) grows along the edge with its gnarly roots in the salty water. Proceeding inland, the black mangrove (Avicennia germinans) grows to a tree size in the brackish waters where the salt enters only periodically. Then farther inland are the white mangroves (Laguncularia racemosa), shorter trees than the black mangrove. Often accompanying them are Buttonwoods. The mangroves are critical to the health of the oceans, as these are the nurseries where the small fish can hide among the twisted exposed roots that preclude access to the larger fish that would eat them. The roots also keep the soil from eroding and help to break the storm surge that causes damage to shorelines during hurricanes. Many wading birds are dependent on the snails and crabs found there. The mangrove forests give way to the interior wetland swamps of the Everglades, Big Cypress Preserve, and Corkscrew Swamp. This vast “River of Grass” is a fragile ecosystem that is crucial to Florida’s flow of water. Though it is considered “stillwater,” there is actual seasonal “sheet flow” toward the sea. The most obvious plant will be sawgrass. Since the elevations vary from continuously wet indentations (often referred to as “gator holes”) to the upland islands that dot the open sawgrass landscape, you’ll find the deciduous Bald cypress trees growing in the water or along the banks of rivers with their “knees” protruding out of the shallows. Pond cypress, Red maples, and Black gum are other trees you’ll see. Bushes include willows, wax myrtles, and buttonwoods. The ground beneath is comprised of marl and limestone. The acid of the pines and other plants erodes the limestone, providing indentations to collect water and upland islands that receive only intermittent water. Cabbage palms dot the higher stands and are adaptable to varied environments. When mangroves and other freshwater areas spend increased time without the typical flooding and fire, they frequently become hardwood hammocks. Hardwood hammocks are a closed canopy system, often referred to as “Tree Islands.” They sit higher in the landscape than the wetlands around them. In many regards they create a micro-climate of their own because of their isolation. They contain a combination of evergreen and semi-deciduous trees. Look up and you will see epiphytes such as bromeliads and tillandsias, commonly referred to as “air plants.” They cling to the branches of the majestic Live oaks. You may even be so lucky as to spot one of the rare orchids. The Spanish moss drapes down in silvery wisps. Other trees you’ll likely see are Gumbo limbo, Sweet bay, Ironwood, Red maple and Dogwoods. 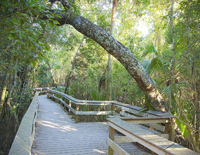 One of the most fascinating creatures of the hardwood hammock is the Florida tree snail. They are about 2-3 inches long and vary greatly in color and band pattern, some even evolved into subspecies in a given hammock. Rumor is that, after collecting as many beautiful and unique snails as possible, the collectors would set the hammock ablaze to assure the exclusivity, thus high dollar value, of their collection. Pinelands are the most common of Florida’s plant communities and they can be found throughout the state. Common pines are slash pine and longleaf pine. The most prevalent species is the saw palmetto, which has gained some fame in recent times with its berries harvested as an herbal supplement. Cabbage/Sabal palms (the Florida state tree) abound in the pinelands, as do wax myrtles, gallberry, beautyberry, St. John’s Wort and wire grass. As beautiful and diverse as our natural areas are, we humans see landscaping as an art form and our subtropical climate provides the perfect palette. If you are a visitor, we hope you enjoy the lushness. If you are a resident of Naples, there are simple steps we can follow to create a beautiful landscape for ourselves while creating a productive habitat for wildlife and protecting the natural environment. Xeriscaping is the concept of landscaping with native plants that require minimal input of water or fertilizers. With a bit of planning it is easy to achieve a lush landscape with minimal maintenance. Palms and cycads represent some of the earliest plants on the planet and they are well adapted to our conditions. Royal palms are an elegant tall, straight palm that you often see lining a long and elaborate driveway. There is almost no end to the shapes and sizes of palms that do well here. Queen, thatch, and silver palms are single stalk, tall palms. 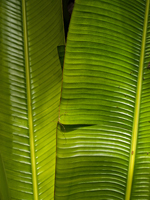 Fishtail, Paurotis, and Phoenix palms are multi-stalked, medium sized. Sago, ponytail, cardboard, and coontie are low to the ground palms and cycads. Fruit Trees are a delicious addition to the home landscape. You’ll find orange, grapefruit, limes and lemons, avocado, mango, banana, guava, kumquat, loquat, carambola (star fruit), lychee, mulberry, tamarind, sea grape, paw-paw, and white sapote are among the many delectable fruiting options. But why stop there? We can plant any number of flowering species to give that extra blast of color. Check out the lists below for some suggestions. You should NEVER plant invasive species of plants in your landscape. They out-compete the natural flora and can easily get out of control in our tropical climate. Invaders: Brazillian pepper, Australian pine, Air potato, Malaleuca, Schefflera, Old World climbing fern, Sanseveria aka Mother in law’s tongue or snake plant. Cattails can clog waterways. If you’ve caught the gardening bug (or maybe it’s caught you) there are landscape design courses you can take at local community colleges and lots of information and assistance available from the Collier County Extension Service. And check out the Master Gardeners program in our area. Happy gardening!